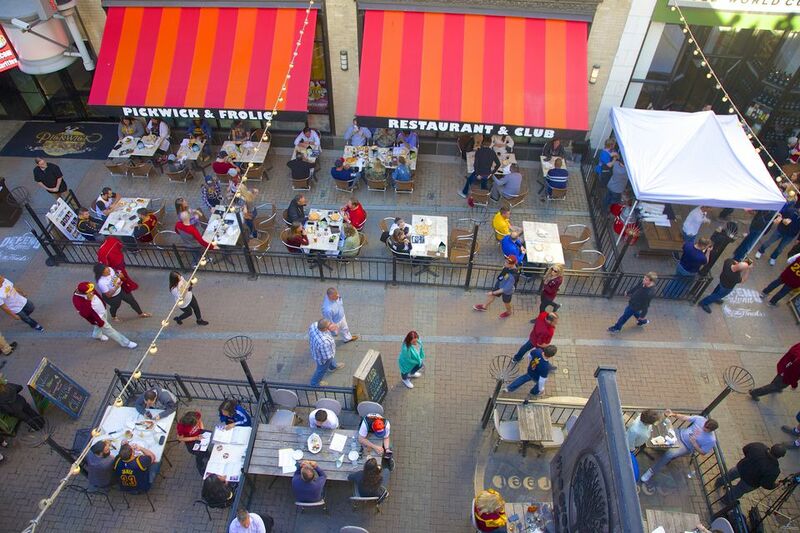 Whether you're looking for a casual place to eat before a game of a place to enjoy an elegant meal, there's plenty of eateries to choose from in downtown Cleveland. These are some of our favorites! Located in the heart of the Warehouse District, at St. Clair and W. 6th St., Blue Point Grille is an elegant and vibrant seafood restaurant, arguably the best in Cleveland. The menu includes a variety of fresh fish and seafood, including live lobster and fresh oysters. Blue Point Grille is open for lunch Monday through Friday and for dinner seven nights a week. Flannery's, in the East Fourth Street Entertainment District, is the quintessential Irish pub. It has good, affordable pub fare, live music, and plenty of Irish whiskeys, beer, and fun. Another East Fourth Street eatery, the House of Blues combines music, food, and fun. The restaurant serves clever Creole cuisine for lunch and dinner daily. Favorites include the "Blues Burger," a loaded cheeseburger with fries, slow-cooked Tennessee style baby back pork ribs with a Jim Beam sauce, and a New Orleans style Gumbo. Side dishes include skillet-baked rosemary cornbread, of course, and spicy sweet potato fries. Located in the East Fourth Street Entertainment District, Lola Bistro is the signature restaurant of Food Network star Michael Symon. The food is eclectic and well-conceived, making use of regional produce and meats. Lola is open for dinner seven nights a week. Reservations are a good idea. Karl's Inn of the Barristers, located across from the Justice Center in downtown Cleveland, is a favorite of court officials, lawyers, and those on jury duty as well as Browns fans and those seeking an affordable and tasty lunch downtown. Mallorca, another Warehouse District eatery, is a taste of Spain and Portugal in downtown Cleveland. Known for its excellent continental service and extensive Mediterranean menu, try Mallorca for a tasty and affordable lunch or dinner. Osteria di Valerio and Al, located in the Warehouse District, is a wonderful gem of a restaurant. Looking more like a New York eatery than a Cleveland one, this twelve-table, northern Italian restaurant serves excellent meats, pasta, and seafood in a stylish setting, accompanied by an extensive and affordable wine list. Sans Souci, nestled in a corner of the Renaissance Cleveland Hotel, is a delightful taste of the Mediterranean. The restaurant's cheery hand-painted walls, bouquets of sunflowers, and friendly unassuming service make it a delight to visit. If you want to check out restaurants in some other neighborhoods, consult these lists!